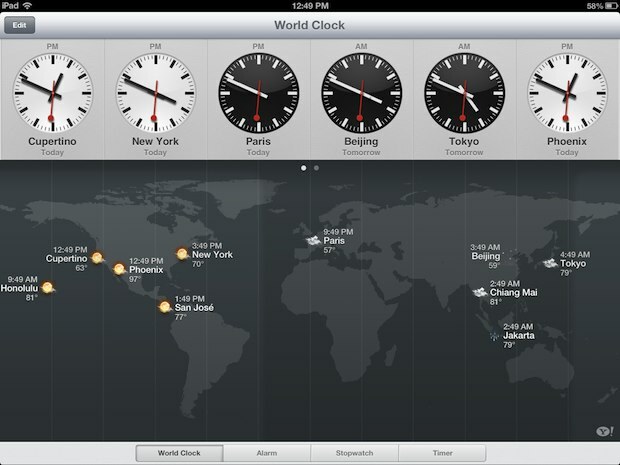 At a glance, World Clock shows the weather and temperature along with the times for each location around the world you specified. You can also tap on a specific location to see a larger version of the clock with the current temperature indicated, as shown in the screenshot at top. The Clock app has limitations though, mainly that it will only provide the current temperatures in locations, so you won’t find any forecasting. For that you’ll want to use Siri or a third party app. 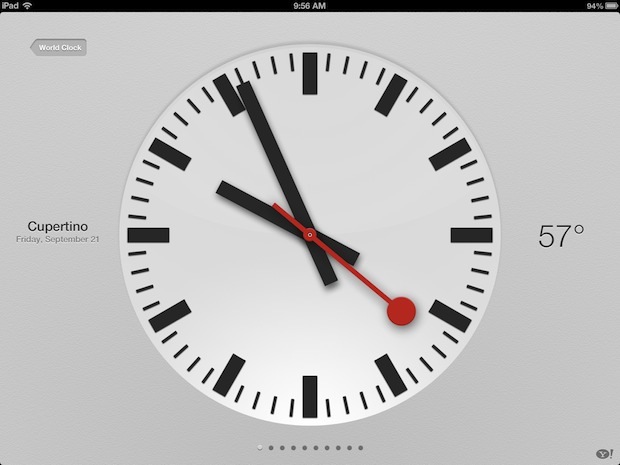 By the way, the full-screen clock makes a great screensaver of sorts for the iPad while it’s sitting around not in use. To have the full screen Clock stay visible, just turn off auto-dimming and screen locking. Weather is obviously a fairly minor and subtle feature, but it’s very much appreciated. Clock design stolen from Swiss Railways. Apple being sued as we speak. It’s also worth noting that the unit of measurement (°C or °F) you set in the Clocks app will also affect the unit of measurement Siri will report.